Nervous-system scientists share how they’re working in a variety of settings. Nic Fleming is a freelance science writer based in Bristol, UK. Concerns that neuroscience’s rise in popularity as a PhD subject has not been matched by a proportional growth in academic positions, coupled with a recent scaling back of brain-science research by many pharmaceutical companies, has led to worries that researchers will be forced to leave the field. But neuroscience is opening doors in a broad range of alternative settings. Nature spoke to five neuroscientists putting their discipline to work to find satisfaction and impact in their careers. Postdoctoral research associate, King’s College London. The world did not end on 21 October 2011. It carried on spinning despite US Christian radio host Harold Camping persuading large numbers of people that once God had finished gathering his chosen few into heaven, everyone else would be destroyed in a fury of earthquakes, tsunamis and fire. Some of Camping’s followers prepared for the end by leaving their jobs and selling their homes. A handful of them feature in the 2016 documentary Right Between Your Ears, co-produced by neuroscientist Kris De Meyer, based at King’s College London. The film highlights neuroscience research into how we form opinions and change or refuse to change our minds. Since 2013, De Meyer has been helping scientists, especially those concerned with climate change and the environment, to use insights from the brain sciences to improve the way that they communicate. “If you understand better why part of your audience rejects what you are saying, you might be able to compensate for that and find more constructive ways of getting your message across,” he says. De Meyer has also been working on projects that build neuroscience and psychology into immersive theatre. He is especially excited about the Justice Syndicate, in which audience members play the parts of jurors. The play helps the audience to gain insight into how people presented with the same evidence reach different conclusions. Public speaker, lecturer and author based in London. Swart originally studied medicine, before completing a PhD in neuropharmacology and working as a psychiatrist for seven years. She moved into leadership coaching a decade ago, after she noticed a “demand for rigorous but applicable neuroscience in the business and leadership context”. Swart uses a range of neuroscience research in her talks and coaching sessions. When discussing nutrition, she describes a study (M. E. Raichle & D. A. Gusnard Proc. Natl Acad. Sci. USA 99, 10237–10239; 2002) showing that the brain uses 20% of calories consumed, and another that found that judges who have recently eaten are significantly more likely to rule in favour of prisoners in parole hearings than those who haven’t (S. Danziger et al. Proc. Natl Acad. Sci. USA 108, 6889–6892; 2011). 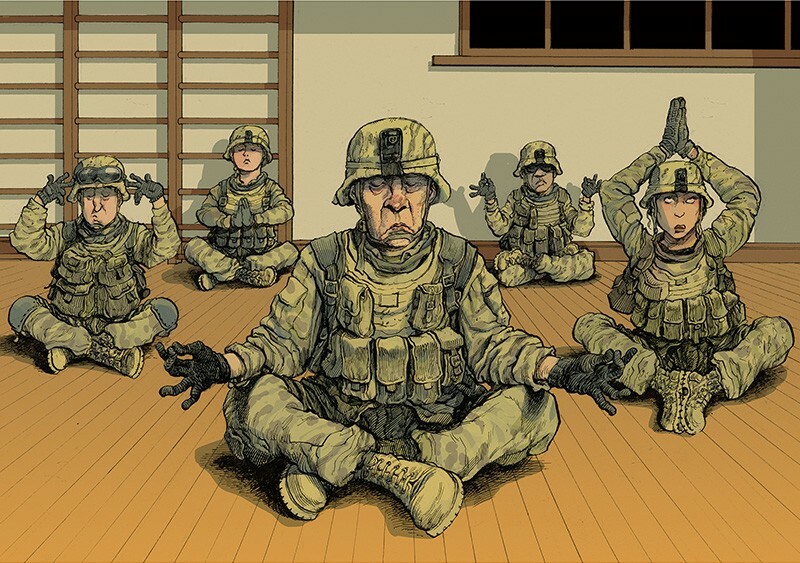 Swart also highlights research that describes how US marines doing stressful combat training showed fewer physiological markers of stress if they had previously attended mindfulness classes (D. C. Johnson et al. Am. J. Psychiatry 171, 844–853; 2014). She tells her audiences to find forms of exercise that they enjoy, saying research shows that rats that voluntarily use a treadmill produce more of a protein that helps support brain-cell growth and survival, called brain-derived neurotrophic factor, than animals forced to do so. “I see myself as a translator of academic neuroscience to business,” she says. Visiting assistant professor, Pomona College, Claremont, California. If you ever go to an improvised comedy class, you may well be told to ‘get out of your head’. This is not an invitation to take recreational drugs. Rather, it’s the idea that setting aside your ego-driven concerns and tuning into your emotions might make you funnier. Ori Amir, a neuroscientist and amateur stand-up comedian, has shown that this advice has at least some basis in science. He asked 13 professional comedians, 9 amateurs and 18 non-comedians to come up with both funny and non-funny captions for cartoons while undergoing brain scans in a functional magnetic resonance imaging machine. Amir’s study (O. Amir & I. Biederman Front. Hum. Neurosci. 10, 597; 2016), which was part of his PhD on perceptual pleasure, was the first to explore brain activity during real-time humour creation. Amir showed that while trying to be funny, volunteers had increased activity in the medial pre-frontal cortex (mPFC) and some high-level semantic regions in the temporal lobes, where information converges from lower-level brain regions. Amir concluded that the temporal regions are the origin of funny ideas because activation there was greater for more-experienced comedians and during the generation of funnier jokes — as rated by a separate group of volunteers. “It looks like ‘getting out of your head’ when doing improv works,” he says. “The neuroscience translation is ‘try to reduce the top-down control of the mPFC and trust that the stream of associations in the temporal regions will lead to funny ideas.’” Other research has shown this can be done through meditation. Global head, neuroscience, Sanofi, Boston, Massachusetts. Drugs giant Pfizer’s announcement in January that it was pulling out of neuroscience research and development (R&D) was just the latest instalment in a string of similar bad news for brain scientists hoping to work in the pharmaceutical industry. GSK, AstraZeneca, Novartis and Merck have all either closed neuroscience divisions or scaled back their brain-science research since 2010. Many saw these moves as adding to the sense that the field had over-promised and under-delivered when it came to real-world impact and application. Several announcements in the past few years suggest that she may be right. Many pharmaceutical companies are hedging their bets by restructuring their neuroscience research divisions rather than axing them entirely. Others, in step with a more general shift in the industry, are diversifying their risk by outsourcing R&D to academic labs and small biotech firms. In January, for instance, Takeda Pharmaceuticals agreed a deal worth up to US$1.2 billion with Denali Therapeutics, in San Francisco, to collaborate on three neurodegenerative disease programmes, and Johnson & Johnson unveiled four neuroscience collaborations with both academic and private-sector labs. In June, Pfizer revealed plans to invest $150 million in start-ups seeking new brain-disorder treatments. To fellow neuroscientists interested in following in her footsteps, Balice-Gordon advises taking time to gain not just deep expertise but also broad knowledge, and says that the importance of networking cannot be overstated. Professor of Neurobiology, Hebrew University of Jerusalem, Israel. Before 1995, neuroscientist Benny Hochner was mainly interested in the mechanisms underlying learning and memory, something he studied in sea slugs with Eric Kandel, who later won a Nobel Prize in Physiology or Medicine, at Columbia University in New York. Then, Hochner was granted funding from the US Navy, which wanted to find out whether the mechanisms through which octopuses control their bodies could be replicated in soft-bodied military robots. This, it was hoped, could be useful for tasks such as surveillance, and search and rescue in complex terrains. He also received support from the US Defense Advanced Research Projects Agency. Hochner, who is now at the Hebrew University of Jerusalem, showed that reaching movements could be triggered in severed octopus arms using electrical stimulation. He found that some often-repeated octopus movements can be independently controlled by neural circuitry in the arm, freeing the brain to focus on other tasks (G. Sumbre et al. Science 293, 1845–1848; 2001). 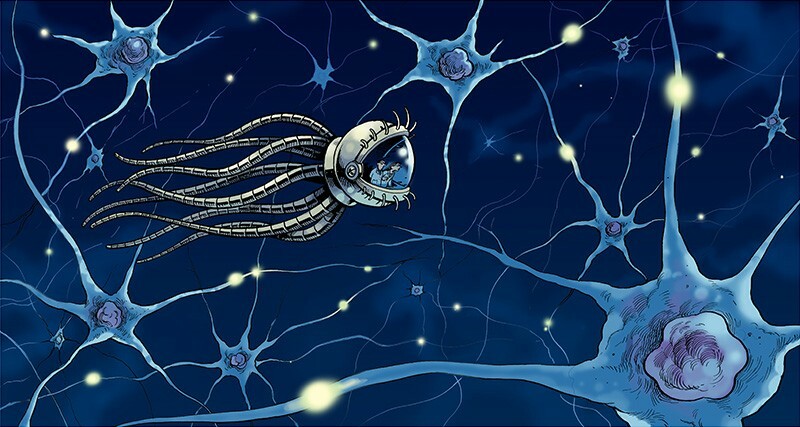 He has also investigated how octopus brains represent and plan for almost limitless freedom of movement. By stimulating electrodes implanted into the brains of octopuses that were then filmed moving freely, Hochner’s group found it was not possible to trigger movement in single arms or body parts. Unlike the brains of skeletal animals such as humans, Hochner found, the octopus brain does not contain specific parts that deal with sensory and motor information from individual body parts (L. Zullo et al. Curr. Biol. 19, 1632–1636; 2009). Hochner has described octopus movement and its evolution as examples of ‘intelligent embodiment’, a phrase used by roboticists to describe autonomous machines that learn behaviour through interacting with their environment. His group has now returned to studying Hochner’s original interest of memory and learning. Long-term synaptic potentiation, a process whereby synapses are strengthened through greater activity, is thought to have key roles in mammalian learning and memory. Hochner’s group has shown it plays the same part in octopuses, suggesting the mechanism has evolved separately in parallel. He also found that, as in mammals, octopus brains have different systems for dealing with short- and long-term memories. This article is part of Nature Spotlight on Neuroscience, an editorially independent supplement. Advertisers have no influence over the content.